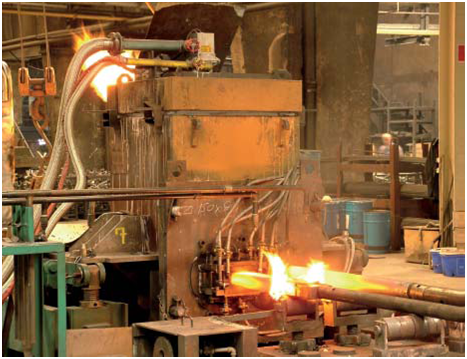 Continuous casting is a reliable casting process to produce high-quality raw materials like tubes, bolts, full, flat, square, hexagonal, octagonal strands as well as customized profiles. This process is applied to cast non-ferrous metals and their alloys, heavy metal and alloys as well as steel and iron alloys. It is characterized by very even composition of the alloy elements, features a stress-relieved material structure, resistance to cracks and high flexibility depending on the material. These properties provide outstanding functional reliability which also enables very good mechanical workability and forming properties. In contrast to die casting, continuous casting is a continuous process. The liquid metal is poured in a bottomless cooled mold. 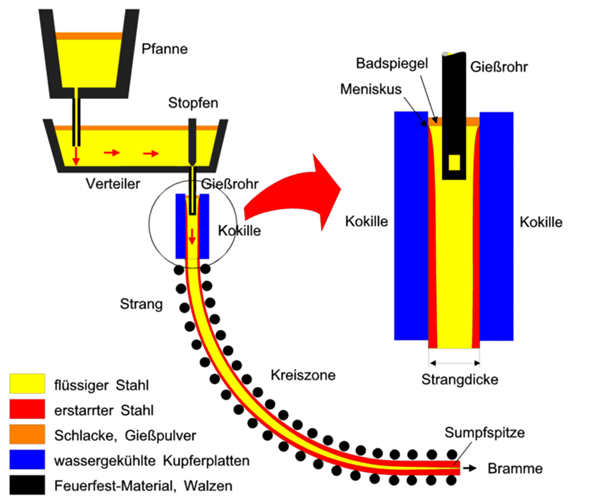 In the mold, the shell of the strand is oscillated and drawn into the casting direction while surrounding the liquid core. After the strand shell leaves the mold, it is further transferred by roller conveyors and further cooled with water until the strand is completely solidified. Afterwards, it is cut to the required length. Depending on the position of the mold, this process is referred to as horizontal or vertical continuous casting (Fig. 1). The strand can be easily transported, as the strand shell slightly rises from the mold under the effect of the solidification shrinkage. However, when leaving the mold, it has to be sufficiently thick to compensate the metallostatic pressure of the residual melt. The water cooling of the mold can be seen as primary cooling. Further cooling (secondary cooling) is provided by water spraying after the mold. Continuous casting from flake graphite and nodular graphite cast iron is performed by horizontal continuous casting. Figure 2 illustrates the three most important components of a horizontal continuous casting plant: Tundish with flanged, quickly replaceable, water-cooled continuous casting mold, driving and drawing unit with electronic control system as well as separation and ejection unit. The continuous casting mold is the most important component and generally defines the surface quality of the cast strands, accuracy, structure formation and casting rate. It consists of graphite and is enclosed by a water-cooled case (Fig. 3).